Pra Raht SangWaLahPiMon or Luang Poo Toh ITatSuWanNon was born on 27th March BE2430 at Bahn Klorng Nahng Noi, Jangwat SaMutSongKrahm (near Bangkok). Luang Poo Toh became a novice since he was young at Wat PraDooChimPlee. At that time, Pra ATitGahnKum was the abbot of Wat PraDooChimPlee. 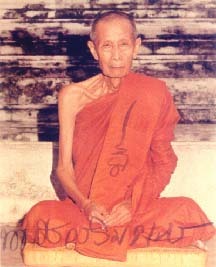 Luang Poo Toh studied dhamma under Pra Ah Jahn Prom from Wat PraDooChimPlee. When Luang Poo Toh was 20 years of age, he was ordained as a monk on 16th July BE2450 by PraKru SamMaNaTamSaMahTahn (Saeng) from Wat PakNam. PraKru ArGatRahNuSit (Porng) Wat NuaNooRaDit and PraKru TamMaWiRat (Chei) Wat GumPaeng were the receptors. After Pra Ah Jahn Prom passed away, Luang Poo Toh went to study dhamma under Luang Por Rong Wat TahGraBeua at SaMuSahKon Province. Sometime later, he went Tudong to many forested places in Northern Thailand, spending many rain retreats there. Luang Poo Toh returned to Bangkok and became the abbot of Wat PraDooChimPlee. He got to know Luang Por Sod, Wat PakNam and they became close friends. Some time later, Luang Por Sod accompanied Luang Poo Toh to learn under the very famous Pra Ah Jahn Nohng at SuPhanBuri Province. After studying under Ah Jahn Nohng for many years, Luang Poo Toh returned to Bangkok. Luang Poo Toh was very popular and highly respected in Bangkok. Whenever there were any ceremony such chanting of amulets, celebration, fund raising etc, Luang Poo Toh would always be invited, because when people heard about Luang Poo Toh's name, they would come to support the ceremony as well. As such, Luang Poo Toh was involved in many mass chanting of amulets such as Pra Somdej Luang Por Pae Roon Rahk chanting at Wat Suthat in BE2494, 25 Puttawat chanting in BE2500, Pra Luang Poo Thuat chanting at Wat Prasat in BE2506B, Pra Somdej 09 chanting at Wat Bahn Koon Prom in BE2509, Pra Somdej Roy Pee chanting at Wat Rakang in BE2515 etc. Beside the lay people, the 9th or the present King of Thailand and the royal family respected Luang Poo Toh very much too. One can see from many photographs of the royal family had taken with Luang Poo Toh. In BE2463, Luang Poo chanted the first batch of amulets made of Neua Phong. The most popular Pim from this batch is the Pra Somdej KaToh , which is very rare and expensive now. Since that time, Luang Poo Toh continue to chant many batches of amulets of many types, such as Pra Pidta, Somdej, Roop Meuan and Rians etc. All Luang Poo Toh's amulets are very well-proven to be able to protect people from accidents and hardship. Luang Poo Toh passed away on 5th April BE2524 at the age of 93 years old.